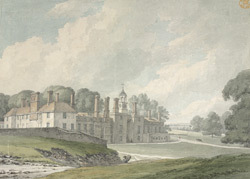 A view of Mote Park, seat of the Charles Marsham, 1st Earl of Romney at Maidstone, Kent. Romney was elected to represent the county of Kent in 1768, 1774, 1780 and 1784. As well as being a substantial landowner in Kent, he was heavily involved in political and civic life. The artist is most likely Thomas Hearne, F.S.A. (1744-1817).